Sample content for project scope, requirements, timeline, and stakeholders. 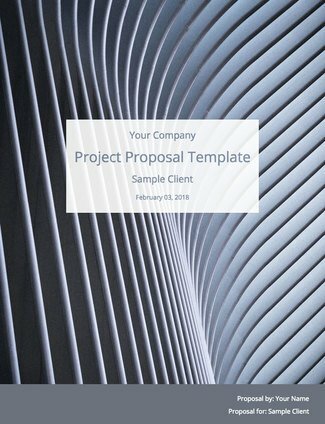 Expert prepared proposal structure to help you win more projects. Each section contains helpful tips along with examples for you to follow. What goes into a Project Proposal? A well-executed project proposal presents an executive summary of a proposed project precisely but doesn’t get bogged down in detail. Its description should include the background of the issue at hand, distinct goals and project plan of action, budgetary and timeline particulars, ownership, and the defined scope of the project. This project proposal template is adaptable to a wide variety of business projects. It follows proven guidelines, and is fully customizable to your needs. Every project is different, but there are some essential elements that must always be addressed. Establishing very clear parameters in these areas will save a lot of confusion down the road. Summary - The overview of the entire project. Having a clear, concise summary makes it easy for higher-ups in an organization to stay in the loop and give approval for the project. This should be more of a brief description. Problem Description and Background - What is the issue the project is addressing? Who is in the project team and who is the project sponsor? What previous efforts have had an impact on the issue? Goals - Specify what exactly the project aims to accomplish. This should tie directly into the problem statement. Scope - The specific action that will be taken to reach each of the goals. Requirements - List the resources, access, and personnel that will be needed to reach the project goals. Timeline or Project Schedule - A detailed map for the project, including time frame, responsibilities and assessment. Budget or Budget Estimate - The projected cost summary. Evaluation - The quantifiable standards for progress, and a plan for how evaluations will occur. Success Criteria - The benchmarks that must be reached for the project to be considered successful. These elements don’t always need their own distinct sections in a proposal; for instance, Evaluation and Success Criteria could both be defined under the same heading. But each of these elements does need to be specifically identified. A successful business project requires coordination at multiple levels of an organization, a strong understanding of the issue at hand, and comprehensive knowledge of the past and future implications of the issue. This means clearly defining parameters such as expectations and impact. When was the issue identified? Has it been addressed previously? If so, how, and who was involved? Who must be involved in this project, and what is their role? Do the parties/team members involved have concerns about the plan of action? How can these concerns be addressed? What are the potential implications of undertaking the project? What does successful completion of the project look like, in quantifiable terms? To accurately pinpoint the solution to a problem, as a consultant you’ll need an exhaustive understanding of the scope and potential project pain points. There might be previous efforts to correct the problem—you don’t want to replicate past work that failed. Or there might be connected systems that will be impacted from the project’s execution. Or the perceived problem might have a less visible root cause. Before a plan of action is proposed, the issue at hand must be understood as completely as possible. Otherwise, the proposed fix might even cause even more issues. Measuring success begins with a clear definition of what success is. The success qualifiers must be clear, specific, and measurable. Imagine if, in the midst of a project, there’s a disagreement. Some involved parties see the project producing the desired outcome. Some don’t. Communication breakdown is imminent. The criteria that must be met for the project to be considered a success. Establish a regular system for the evaluation of progress, so that everyone stays on the same page. If a piece of a project doesn’t have clear ownership, it won’t get done. That leaves the project manager scrambling to tie up loose ends. Hurry and confusion can lead to mistakes. Cut that problem off at the head by specifically designating the personnel in charge of every aspect of the project. The timeline is a great place to accomplish this—that way, the roadmap and how everyone fits into it are made clear from the start. Unfocused, mismatched goals can sink a project. Scattered priorities can conflict with each other, and make project success much less likely. Keep the project management and project’s vision centered squarely on a single issue, and make sure your goals all impact that issue directly. Gregory Ciotti has a great article on creating persuasive project proposals on the Bidsketch blog. Of course, there’s also the Bidsketch proposal software that makes writing proposals easy and has helped Bidsketch customers collectively earn over $1 billion. On the Guru.com blog, Jennifer Reinoehl has a piece listing tips and guidelines for getting started. This short article is useful if you start feeling overwhelmed by the size of a project and find it difficult to get started. Nathan Ingram has a more in-depth article with some excellent advice over at iThemes.com. Example: ABC insurance is keeping its digital records on a computer database system last upgraded in 1985. This legacy system is becoming increasingly unreliable and expensive to maintain. Digital Database Inc. is a company dedicated to providing quality database storage and access; they offer their services in transferring ABC’s records to Digital Database’s state-of-the-art and regularly updated database. Once the records transfer is completed, ABC will have remote access to their data without the need for expensive and troublesome legacy hardware upkeep. The estimated budget is $10k, and Digital Database will require two dedicated database personnel. Example: Digital Database Inc. has been helping companies with remote and on-site data solutions for over 20 years. We are dedicated to providing unfailing database services to your business and technical specifications. Has the problem been addressed in the past? How? In what ways might these past efforts help or hinder the project? What is the impact of the problem to target and surrounding populations? Example: ABC’s database hardware was last updated in 1985. Costs of maintenance and recognition of data vulnerability to mechanical errors became apparent in April 2005. In November 2010, a plan was drawn up to migrate ABC’s data to a new in-house server, but the attempt was abandoned due to cost issues with the hardware supplier. The migration plan from the 2010 proposal should help streamline the planning process. Example: Goal: Transmission of all ABC records to the Digital Database remote solution by May 2018, with less than a .01% error rate. Example: The data migration will take place in four steps: 1) the identification of all data to migrate, 2) the transfer of identified data to the Digital Database remote solution, 3) verification of successful migration, and 4) training of ABC personnel on remote access tools. Example: Digital Database Inc. will require access to two ABC database administrator personnel, full access to the ABC database system, and a $2,000 monthly retainer. Example: The Digital Database and ABC tech leads will conduct weekly conferences during the migration to ascertain the % volume of records transferred, and the % accuracy of the records successfully migrated. Example: With any migration, there is chance of data corruption. ABC estimates that significant data loss could have as much as a $1 million impact. Digital Database Inc. recognises this risk and has a competitive recompense package. Example: 1) 100% of ABC records migrated to Digital Database remote solution. 2) Data transferred with a corruption margin of .01% or less. 3) Data fully transferred to Digital Database servers by May 15, 2018. Example: To formalize this proposal into a contract, call Digital Database Inc.’s Technical Supervisor, Bob Gee, at (999)999-9999. Include a free trial of online proposal app Bidsketch?